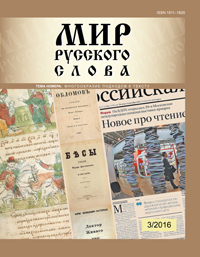 The article is devoted to the use of multifunctional and polyfunctional, direct and indirect speech acts, which are forming the complex speech moves — the combinations of speech turns connected by the relations of illocutionary equality — in the original dialogic fragments of the “Russian Primary Chronicle” (“The Story of Passing Years”). Keywords: Old Russian discourse; complex speech turns. The article discussed the changes of word meaning in child’s language consciousness at the age interval from 3–4 years to the primary school student. Keywords: meaning; meaning structure; psycholinguistic experiment. The author investigates words with emotional, evaluative and cultural connotations in Russian and Chinese languages from the perspective of linguoculturology. The core meanings of such words are emotionally neutral, but can obtain emotional evaluation in the context of verbal communication. The words with emotional evaluation and cultural connotation are not only expressing semantic meaning and emotional implication, but are also reflecting nation’s cultural traditions and worldview. Keywords: linguistic culturology; linguistic worldview; words with emotional evaluation and cultural connotation; Russian and Chinese languages. The article offers a general categorization system for the image descriptions, based on respondent-used communicative strategies, and analyses it from the perspectives of semantics and cognitive science. The author proposes a categorization method for multilayer images, based on selection of the basic level of reality. Keywords: Russian language; image description; communicative strategies; associations; levels of reality; multilayer images. The article analyses some events in the social life and scholarship of the 1930s, relating to the problems of the construction of linguistics. One of the notable episodes of the struggle of ideas and ideologies in that time was the publication of the first Soviet normative dictionary, edited by D. N. Ushakov. The paper gives information about the authors of the dictionary, their work process, differences of opinions, etc., in the context of the linguistic debates of the time, emphasizing the fact that the dictionary had become the target of official Marrist criticism. The author presents unique documents, showing the personalities of the scholars, tension of their battles, the arguments of the discussing parties. Represented facts are the evidence of ambiguous situation in the linguistics of 1930s. Keywords: Russian language; lexicography; Marrism; the debate on the issues of language culture; language policy; linguistic debate in 1935; explanatory dictionary; archival documents. The article discusses two types of interpretation of Dostoevsky’s novel “The Possessed”: the experience of philosophical and literary historical criticism, on the one hand, and the actual philological reflection, on the other. The author reveals the possibilities and limitations of both approaches in connection with their underlying hermeneutic assumptions. Keywords: Dostoevsky’s novel; philosophical criticism; literary historical criticism; philological reflection, Hermeneutics. The author argues that the speech formed in the mass media has the following communication qualities: utility, relevance, performativity, multiple channels, variety of styles. The relevance of mediaspeech defines its connection to the specific conditions of social space and time. Lexical, grammatical and meaningful features of mediaspeech are designed for easy perception, and are oriented to the certain type of audience. Keywords: speech in the media environment; relevance; utility; performativity; social space and time. The paper describes the aesthetic function of Russian language communicative means in creating an Evil Wizard character in children’s cinema (“Aladdin’s Magic Lamp”, 1966). It shows how the actor forms this character using the voice tone means, quite indifferent to the lexical and syntactic structure of utterance, and blurring the boundaries of objectives. Keywords: aesthetic function of communicative means; communicative semantics; spoken film dialogue; actor’s communicative strategy. This article discusses the functional role of Russian language communicative means (such as interjections, particles, intonation types, etc.) in the formation of Tabakov — Bogatyryov actors ensemble in the N. Michalkov’s movie “Oblomov” (1979). Keywords: semantic communicative analysis; communicative interpretation; actors ensemble. The author analyses scholarly achievements of V. N. Teliya’s during all her life, and demonstrates the dynamics of her linguistic interests. This dynamics is presented as spiral, since the scholar had been stepping aside from Russian phraseology problems and returning to them on the other methodological positions. 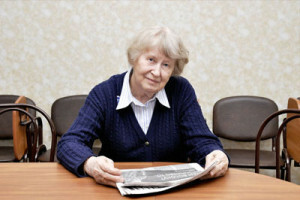 The results of V. N. Teliya’s creativeness were her own theory of linguoculturology with proper set of terms, notions, and methodology, as well as her unique phraseological dictionary, helping to explicate the Russian cultural code. Keywords: phraseology; Russian cultural code; connotation; expressivity; emotivity; linguoculturology; phraseological dictionary; spiral dynamics. The article presents the classification of different types of culturally marked words in Victor Pelevin’s short story “Sleep”, and characterizes their functions in the development of story’s artistic time and key philosophical ideas. It also analyses the problems of realia interpretation in the English translation of the story. Keywords: time in narration; realia; cultural reference; translation; Pelevin. The article describes the specifics of the work with the high level of proficiency students during the short-term training, focusing on the contents of the grammar teaching program, and emphasizing the necessity of studying the phraseological sentences, which perform the phatic function in communication. Keywords: Russian as a foreign language program for grammar studies; short-term training; high level of proficiency. The article is devoted to the training of Mongolian students while using the educational complex “Road to Russia”, and discusses the possibilities of introduction of some Russian grammatical structures in RFL Mongolian class of elementary level. The author considers expedient the use of translation as a methodological technique that allows to optimize the learning process. Keywords: Russian as a foreign language; grammar; teaching; Mongols. Balakova D., Kovachova V., Mokienko V. M. Nasledie Biblii vo frazeologii. — Graifsval’d: Ernst-Moritz-Arndt-Universität Greifswald, 2013. — 307 s.
(Tipogr. «Valinex»). — 437 p.